HARRISBURG, Pa. – The National Frozen & Refrigerated Foods Association (NFRA) has announced the winners of the Golden Penguin Awards for its 2018 March Frozen Food Month promotion. The March promotion helped the industry drive traffic in the frozen food aisles and increase sales for many categories and brands. NFRA has awarded 39 Gold Awards and 23 Silver Awards. In addition, five companies will be revealed as Top Marketers during the NFRA Convention in San Diego. See the complete list of winners. The Gold award winners will be recognized throughout a Networking Reception on Monday, Oct. 22, 2018 at NFRA’s Convention, and the Top Marketer awards will be presented. Silver awards are typically presented at the local level at appropriate frozen food association meetings. 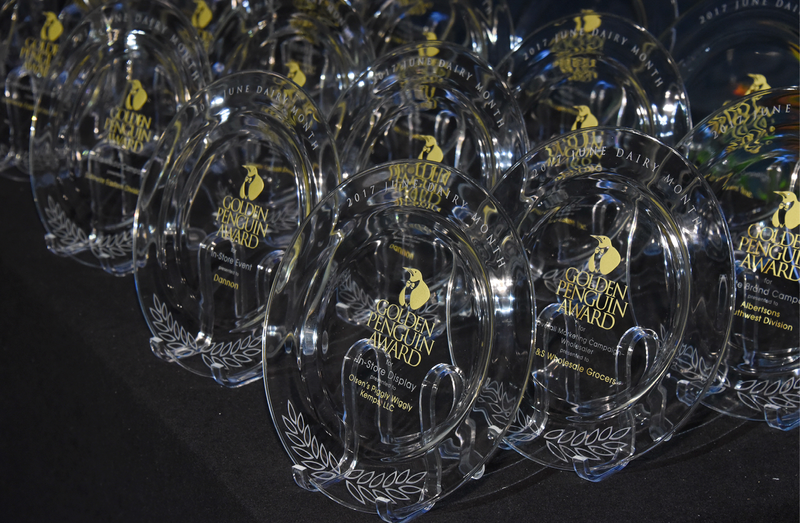 In an effort to create a renewed level of prestige and recognition for this flagship awards program, NFRA made significant changes to the Golden Penguin Awards program in 2016. New categories that better reflect today’s marketing practices, a streamlined online entry system, a numeric scoring platform and a redesigned award provided a fresh opportunity for companies to be nationally recognized for excellence in merchandising and marketing frozen and refrigerated foods. Participants could choose from eleven categories including: In-Store Display, In-Store Event, Community Involvement, Social Media Campaign, Traditional Marketing, Private Brand Campaign and Overall Marketing Campaign with sub-categories for – Retailer, Wholesaler, Manufacturer, Sales Agent and Local Association. Plus, the Top Marketer Awards honor the best of the best. The highest scoring entry in each of the Overall Marketing Campaign sub-categories will be named the Top Marketer. Retailers, wholesalers, manufacturers, sales agents and local associations of any size (retail and military) could enter any category applicable to their business. Entries were judged on their own merit taking into consideration organization size and/or program budget. Companies can participate in the Golden Penguin competition for NFRA’s other promotions for June Dairy Month and Ice Cream & Novelties.